Austria is a remarkable country that is surprisingly overlooked by many teachers when looking to decide their ideal destination for a school trip. NST’s travel experts have helped to organise hundreds of school tours to Austria, each one tailored to suit the specific learning focus of a group. We’re here to take the stress of organisation away from teachers by creating a watertight itinerary that covers everything: travel, accommodation and tickets. As well as being fairly manageable in size, Austria is also renowned for its excellent transport system which offers a very safe and simple way to travel between places. Our most popular destinations are Vienna and Salzburg, both of which are fantastic cities to experience authentic Austrian culture – from music, art and architecture to shopping and food. Vienna boasts a fascinating history that few other major European cities can rival. The origin of iconic areas such as the Graben and Kohlmarkt can actually be traced back to Roman times, and have remained at the heart of city life for centuries. Meanwhile, the Gothic and Baroque eras spawned magnificent, ornate structures such as St. Stephen’s Cathedral and Schönbrunn Palace. There are few better ways to learn about Vienna’s evolution – particularly moving into the 20th century – than our exclusive walking tour of the city. Key sites such as Leopoldstadt, Judenplatz and the Museum of Austrian Resistance offer a memorable learning experience for history groups focussing on World War II. Many groups also choose to visit Mauthausen Concentration Camp or the nearby town of Linz, famously Adolf Hitler’s hometown. For those focussing on psychology or sociology, the Sigmund Freud museum and Narrenturm are must-see attractions. Salzburg lies over in the east, a mere two-hour train journey away from the capital. As the birthplace of Wolfgang Amadeus Mozart, Salzburg has an unrivalled classical musical heritage that continues to this day. The range of top notch performance venues catering to all levels of ability – Salzburger Dom, St Michael’s Basilica, Schonau am Konigsee and the Mirabell Gardens to name just a few – makes it a fantastic location for a music school tour. Beyond music, the city also offers plenty of interesting excursions such as the famed Konigsee boat trip. Thinking about your own school trip to Austria? Get in touch with our team of travel experts today on 0845 293 7970 to talk through options and arrange your perfect school trip. From the capital of a huge Empire to a small troubled nation state, from its Nazi past to its role in the Cold War, Vienna bears witness to many of history's major events. Find out more. The city of Salzburg has an historic musical tradition and always provides our music groups with an enthusiastic reception. A perfect destination for groups of all abilities. Find out more. The city of Vienna has an historic musical tradition and always provides our groups with an enthusiastic reception. 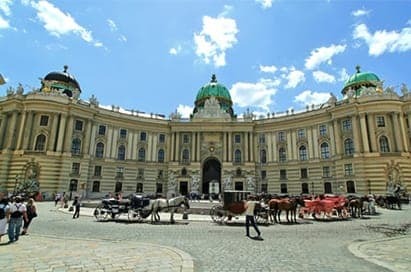 Vienna hosts some of the most prestigious venues in Europe, and is ideal for more formal groups. Find out more. Vienna, home to Sigmund Freud and birthplace of psychoanalysis, is a city linked with the atrocities of World War II. Here, cheering crowds greeted Hitler in 1938; the destruction of the city’s Jewish community followed. For psychology and sociology students, this makes for a eye-opening learning experience. Find out more.